Date and Location of Birth: A long time ago in a galaxy far, far away…. 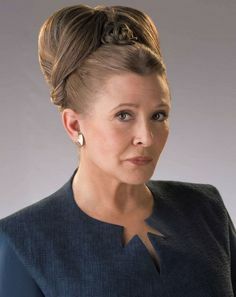 General Leia Organa presented for treatment as a strong, witty, and compassionate woman in her 50s who was referred for treatment by a concerned friend, Chewbacca, for “uuhgguughhhghghghhhgh wuuh raaaaahhgh uugggh aguhwgggghhh raaaaaahhgh huuguughhg.” Translated from Shyriiwook, that meant that she recently suffered the traumatic loss of her ex-husband (Han Solo) at the hands of her son (Ben Solo, aka Kylo Ren, aka Matt the Radar Technician). Leia reported viewing the timeline of her life as clustering into a series of events that felt like distinct episodes. When asked to elaborate, she provided details about five of these so-called episodes. Leia and her twin brother, Luke Skywalker, were born 19 years before the Battle of Yavin on Polis Massa to their biological mother, Padme Amidala. Tragically, Padme died immediately following childbirth. Meanwhile, their biological father, Anakin Skywalker (Darth Vader) had turned to the dark side and would not have been a suitable parent. A family friend and mentor, Obi-Wan Kenobi, took great care to place Luke and Leia in loving homes. The twins were reared apart: Luke was raised on Tattooine by his step-aunt and step-uncle, while Leia was adopted by Senator Bail and Queen Breha Organa and raised on Alderaan. The Organas were a royal family, and Leia was a princess on Alderaan. By age 19, she was a member of the Imperial Senate like her father before her. She also worked with the Rebel Alliance, a group fighting the evil Empire. After the Rebels stole the plans for the Empire’s massive weapon (the Death Star), they were given to Leia, a testament to the high regard in which she was held. Darth Vader captured Leia, tortured her, and utilized a mind probe in order to learn the location of the Rebel base. However, none of these strategies were effective on Leia, who exhibited exceptional fortitude and refused to reveal the base location. In response, the Empire tragically destroyed her home planet, killing her entire family. She was ultimately freed from capture by a smuggler named Han Solo, Chewbacca (Han’s co-captain), Obi-Wan Kenobi, and Luke (who she did not know was her brother at the time), and re-emerged as a major player in the ultimately successful mission to destroy the Death Star. Leia continued in a leadership role against the Empire, which attacked the Rebel Alliance’s base on the planet Hoth. She organized the evacuation of the base and then escaped with Han and Chewbacca on their ship, the Millenium Falcon. During their challenging voyage from Hoth to Cloud City to seek ship repairs, Han and Leia fell in love. When they arrived at Cloud City, Darth Vader captured them. He froze Han in carbonite and gave him to a bounty hunter (Boba Fett), who was hired by a gangster named Jabba the Hutt. Eventually, Leia and Chewy escaped Darth Vader with the assistance of Han’s friend, Lando Calrissian, and reunited with Luke. Leia courageously developed a plan to disguise herself and rescued Han from Jabba. Unfortunately, she was later captured and enslaved by Jabba. Leia’s bravery, resourcefulness, and strong interpersonal connections helped her to break free (with the help of Lando). She and her friends then went to Endor to continue fighting with the Rebels against the Empire’s second Death Star. With some help from the Ewoks, they successfully defeated the Imperial forces. This episode was particularly significant because Leia learned that Luke was her twin brother and that Darth Vader (now deceased) was her father, and she reaffirmed her love for Han. Leia recalled this period as the beginning of one of the happiest times in her life. For a while, Han and Leia had a wonderful life together, got married, and had children. The happiness did not last, however. One of their sons, Ben, was training as a young Jedi with Luke and turned to the dark side. Ben took the name Kylo Ren and began working as a commander for the evil First Order. This absolutely devastated Han, Leia, and Luke. Feeling helpless and heartbroken, Han and Leia separated and turned to their old lines of work for solace and distraction while Luke disappeared. Han returned to smuggling with Chewbacca and Leia became the General of the Resistance, leading the fight against the First Order. 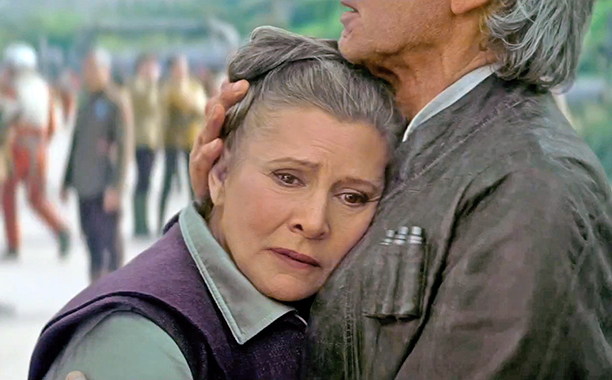 Circumstances brought Leia and Han together again to fight the First Order, and it was clear that they still shared a deep love and respect for one another. As Han left to disable the First Order’s weapon (Starkiller Base), Leia pled with him to bring their son home, saying, “There is still light in him. I know it.” He tried his best to bring Ben back home, but tragically, Kylo Ren killed Han. All diagnostic assessment information was gathered through behavioral observations (i.e., watching Star Wars movies). Based on the losses and traumatic events Leia went through, it was hypothesized that the most likely disorder that Leia might be experiencing, or be at risk for, was post-traumatic stress disorder (PTSD). When considering the diagnostic criteria for PTSD offered in the current version of the Diagnostic and Statistical Manual of Mental Disorders – Fifth Edition (DSM-5), Leia certainly faced traumatic events (e.g., loss of her home planet, loss of her father, loss of her husband, and the loss of her son to the dark side of the Force). However, Leia did not exhibit any of the other diagnostic features (e.g., re-experiencing of the traumatic event, avoidance of related objects or environments, or hyperarousal) associated with PTSD. Beyond that, Leia did not seem to exhibit any other symptoms related to mental disorders. Her emotional response appeared to be an expected amount of grief and emotional pain in light of the circumstances. In summary, Leia does not currently meet the diagnostic criteria for any specific mental disorder. Overall, she appeared to be displaying an appropriate amount of grief given the tremendous amount of loss she had experienced. It is recommended that Leia return for a follow-up session to assess her mental health once some more time has passed to determine whether Leia experiences a normal grieving process. In situations like this, even in the absence of a specific disorder, it is possible for complicated grief to develop. Complicated grief is when an individual engages in avoidant coping strategies while never actually processing through their emotions. Oftentimes, this leads to increased risk for psychological disorders. In the meantime, Leia should continue to engage in good self-care, embrace social support, and return to therapy if needed. Supportive counseling or bereavement support groups are also options for Leia, should she decide to seek additional help. Was the portrayal of mental health concerns accurate? It seems unlikely that Princess Leia was written with the goal of portraying any specific mental disorders, particularly given that she isn’t shown to be experiencing any significant symptoms. That being said, the manner in which she handles challenges and losses is certainly within the realm of realism for someone with her resources and personality characteristics. Moreover, while many people develop PTSD in the face of trauma, the majority of people do not. Therefore, the depiction is accurate in that sense as well. Was the person with mental health concerns depicted with compassion? As depicted so far, Leia is not experiencing any mental health symptoms; however, we do feel that she is depicted compassionately. The reality is that all individuals face loss, challenges, and adversity in different ways. Leia is seemingly able to navigate these tremendous hurdles with strength and grace. Not only is she able to maintain her personal values and continue pursuing her own goals, she also often provides emotional support and guidance to others. On a rating scale from Star Wars: The Holiday Special (it really is terrible) to Star Wars: The Empire Strikes Back (probably our favorite in the series), we give Princess Leia the rating of…. Empire Strikes Back! Princess Leia is a role model for all of us. She is brave, caring, intelligent, and does her best to help others even at great personal risk. Everyone around her looks to her for strength and leadership. Finally, it is also worth noting that Carrie Fisher, the actress who plays Leia Organa, has been open about her own struggles with mental health issues including bipolar disorder and addiction. She fights stigma and has been a real-life hero to many people.